The 2012 London Olympic basketball tournament at the London Arena has been a success with record crowds. Most of the games involving France were followed by more than 9000 people in the hall. There was not much difference in attendance figures between the men's and women's game. The quarter-final matches for the women's games will be played at the London Arena and then the rest of the competition at the O2 Arena. Although Great Britain had been eliminated the organisers are expecting even more people to attend in the much larger Arena. The organisers of basketball in Great Britain are hoping that the success of the London Olympic Tournament will help bringing basketball into the British limelight. With the group phase over a new competition starts with the quarter-final round: only the winner of each match qualifies for the semi-final so the pressure is now on. For eight teams the Olympic dream is still on after qualifying for the quarter-final while for Angola, Brazil, Croatia and Great Britain it is already over. France beat Russia in their last group game (64-54) to finish the first phase undefeated. The first 20 minutes were not crisp by either team with plenty of unforced errors. Russia won the first quarter (15-10) but France went into the locker room leading (25-21). 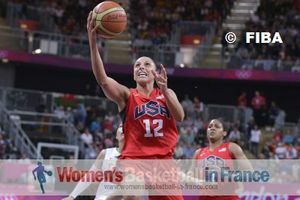 France blew the game apart from the start of the third quarter with a 12-2 run and ended the game as a contest by the end of the quarter with a buzzer beater (55-34). All the French players scored at least 2 points in the game. Céline Dumerc was the only player in double digits with 12 points. Despite the victory Pierre Vincent's thoughts are about the quarter-final because only a victory will keep the dream of an Olympic medal alive. During the 2000 Olympic Games, France finished second after the group phase but lost in the quarter-final to Korea so nobody in the French delegation is taking anything for granted. All the players have been consistent in their statements that they are working as a team with an objective of challenging for a medal. 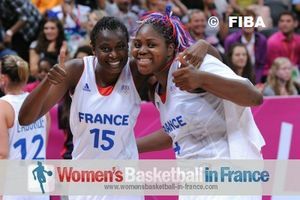 womensbasketball-in-france's thoughts: The whole atmosphere before the Olympic Qualifying Tournament was one of caution from France. The players have not given many interviews and even when they do, they just analyse the current situation or talk about the Olympic experience. This is a big change from previous seasons where they were more open to discus team dynamics. For French women's basketball, the quarter-final against the Czech Republic is for this moment of time the "most important match" for this team. USA finished top of Group A as they made five wins from five with a (114-66) victory against China. The result saw China drop down to third spot and stay in America’s half of the draw (bracket) for the quarter-final. Diana Taurasi led the way with 22 points for an American side who had all 12 players on the score sheet, with six finishing in double figures. They also set a tournament record with 33 assists. The competition’s leading scorer Nan Chen led China with 16 points. The Czech Republic picked up the last quarter-final spot with a comfortable victory against Angola (82-57). All the Czech Republic players scored with Michaela Zrustova leading the way with 20 points while Eva Vitecková finished with 19 points. Nacissel Mauricio led Angola with 18 points. The final game from Group A had no value (dead rubber) because Turkey was assured of second place and Croatia had already been eliminated. Turkey won the game (70-65). In Group B, France secured the group win by defeating Russia while Australia moved into second place with a victory against Canada (72-63). Brazil and Great Britain bowed out of the London Olympic Basketball Tournament with Brazil winning (78-66). 11 August 2012: Who is playing basketball for France at the 2012 Olympics Games?